A new issue and a new challenge, this article will cover the ever elusive realistic flames. This time around we will attempt to work this effect into an entire composition. This is more challenging than it sounds due mostly to the fact that three-dimensional cubes can be very tough to draw and to paint in proper pose. These are the things that have perplexed you since high school art class. But, no worries, we shall fear no project! There’s much to do in this composition, so we had best get started. First off you will need a surface to paint this piece on. I chose a composite panel made up of a thin PVC core with aluminum on either side. 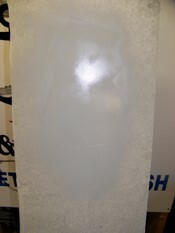 These panels are usually used for signs but make great durable rigid panels to do demo airbrush work on. The panel I have already has a black finish on it so all I have to do is scuff up. Fig. 1 – Clean and scuff so your paint will stick. Once you cover the panel you will next need a pencil and brand new x-acto knife. As you will see in the pic, I simply drew my design with the pencil straight onto the mask. Now drawing these cubes is a task in and of itself. You want to use a pose that will really make your cubes look like tumbling dice. You will find out that drawing these is easier said than done. Here is a tip: Always make sure that your lines on each side of the cube are parallel, meaning if you continued them forever they would not touch. Also, the lines that intersect at the top and bottom of the squares should intersect at the same angle. This is tricky, but use a ruler and keep drawing until you get it right. If it looks wrong it will look fake, and remember that. Fig. 2 – Keep the cutout to piece in your mask later. Fig. 3 – Cool clean cuts make a crisp design. You can probably guess the next step, which is to cut carefully along the lines with an x-acto blade. Don’t apply too much pressure and use a ruler to keep straight lines. Next we go up to the shop to start the spraying. I am using an Iwata HP Plus gravity feed brush for this project. I do not use this brush nearly enough and it is just as good as my HP-C, so let’s knock the dust off it. 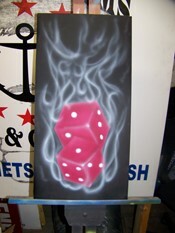 I use some white to prime the area of the dice and lay down a good, even coat as a base for our candy apple red. Next we begin with the red candy. This paint has very distinct characteristics to consider when using. First off, it is transparent and gets darker the more passes you lay down. This would be impossible to get a uniform value out of normally, but this is going to work to our advantage in this case. Once the red has been established to your liking then we can begin to play around with our dimensional shapes. Now, as I mentioned earlier, we will use the building quality of the candy color to bring out the dimension in these dice. I usually cut and unmask one section of the die at a time and darken or lighten the edge depending on the light characteristics for the cube. In some cases I use a piece of paper to mask a line on the fly. Fig. 5 – Paper and index cards make a great free-mask. Fig. 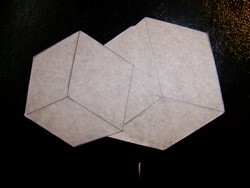 6 – Make sure your boxes have a bit of light and shadow. 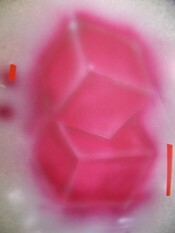 Next, with the transparent white still in the brush it is time to put in those dots. For this we keep the same brush and same settings. The trick to doing this right is holding a die in your hand and framing it up just as it is in the picture. Then pay close attention to where the number dots land and also how they are shaped. You will notice the dots on the broad side of the dice will be larger and round, but the other sides (since they are in perspective) will have smaller, less concentric circles. These perspective dots will be orblike. Fig. 7 – Make sure your dots are adjusted for perspective. Well, now you have a great looking pair, but they are not hot enough, and we need fire. After unwrapping all your masking, keep that Iwata HP-Plus just the way it is, as now we enter the realm of the realistic flames. Realistic flames are possibly the easiest-hardest thing to do with an airbrush. Built on the theory of candy colors I have explained in many articles, these flames are stacked in layers. 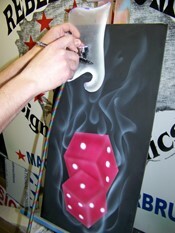 First, use an Artool freehand stencil to wisp in some smoky lines. Set yourself free and let these lines have a life of their own. Don’t try to make them look like the flames you see in your head; they have to be random. Fig. 8 – Building the flames is a layering process. Next use your freehand prowess to elaborate on these lines. Remember that the value of white will directly affect the value of the candy colors going over the top. Put simply: when candy hits black it is black, when it hits white, the brighter white the brighter color. Think of it like a “magic” marker—you color a picture with invisible markers and then the magic marker makes a picture show up when you color over it. Fig. 9 – You might like it just like this, the ghost flames. Now that you ate your veggies, it’s candy time. Take that same Iwata HP-Plus and fill it up with some yellow candy. Then go crazy because you really cannot mess this up with candy. When you spray over the whites, it will turn yellow, but if you hit the black, the transparent yellow never shows up. Fig. 10 – Lay on the transparent yellow to light up the flames. Next is the layering of the colors. Using a bit of the candy red you can spray over the yellow in spots where you would like a deeper, darker color. Guess what—transparent colors take on what’s underneath, so red and yellow make orange! Flame orange! Keep building up layers to your liking. You may even want to go back and put in some more white, repeating the candy process to brighten certain areas. For a more in-depth explanation of the flame technique, see the Archives for my other articles on this topic. Well, if and when you decide you are satisfied, spruce it up, sign it and shoot on a clear coat and enjoy. Till next time, Keep on Paintin’. Fig. 11 – All finished and it looks like a hot hand!